Connection is contact that restricts your opponent’s movement while improving your own ability to move. Rickson Gracie enjoys a reputation as the greatest jiu-jitsu practitioner ever. Whether you believe his claimed 465-0 fight record or not, respected coaches such as Fabio Gurgel say Rickson’s reputation is deserved. Is Rickson simply a superior athlete with impecable timing and co-ordination, or is his invisible jiu jitsu the key that distinguishes him from everyone else? 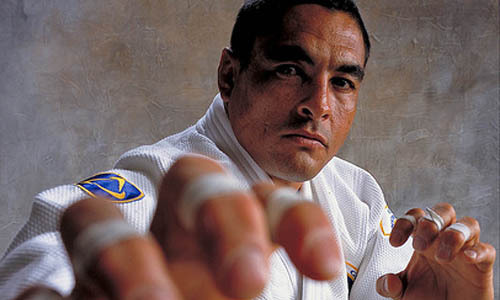 Rickson says invisible jiu jitsu is a combination of base and connection. We talked about base previously, but what is connection? There is much curiosity and confusion about connection, but no clear description. Part of the fault lies in the unfortunate choice of name. The name connection is also used by several internal martial arts to imply mystical and indefinable forces. 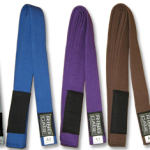 A Jiu-Jitsu Magazine article furthers the confusion by describing connection as a kind of mind meld with your opponent where you can sense their intention before any movement occurs. How do others describe connection? Fortunately, two different seminars where Rickson discusses connection are now online. Before we examine them, let’s see what other people who have trained with Rickson say about connection. With it my timing is perfect and I feel like I can read the mind of my opponent or anticipate his or her actions. Without connection, I feel that I’m struggling for the perfect leverage, angles, weight distribution and base. Two people joining their bodies so that they make one unit and you are in control of how that unit moves. Connection is the ability to transfer your energy to another person so that when you move, your opponent immediately feels the effects of it. when you’re connected, there is a certain tension in the arms as well as the legs, and that allowing that tension to disappear is to give up the connection you have to your opponent. When we are connected, we shift our weight in a way that doesn’t give our attacker anything to use against us. being connected allows your base to remain independent of your opponent’s actions, while his lack of connection allows you to manipulate his weight and posture. being connected is about inhibiting the opponent while improving your own ability to move. the connection point works best against your opponent’s resistance because it not only blocks that resistance, it allows you to move more easily away from it. Each of these descriptions are vaguely similar but the commonality isn’t obvious, yet. How does Rickson explain connection? Below are two different occasions of Rickson teaching connection. After watching these, I’m more confused than ever. In both those seminars, Rickson says he is explaining connection, but what I see him doing is hugging tightly and talking about base. Cane Prevost, recounts a similar experience of a Rickson seminar. In fact, instead of giving us details about posture (where to put your hips, your hands, shoulders etc) he talked about how the position should feel. He did a lot of that. He used the words “base” and “connection” a lot. I found the whole thing fascinating and left the seminar curious but unenlightened. I knew I had experienced something profound but wasn’t yet sure what it was. Just as Rob Biernacki elegantly describes base as a platform from which you can deliver and absorb force , I want a similarly elegant description of connection. Fortunately, Andreh Anderson nails it in one of his above descriptions of connection. Rewording slightly, we have our elegant description, connection is contact that restricts your opponent’s movement while improving your own ability to move. This description describes the function of connection, rather than form. I discussed why this is important in the last post. Rickson demonstrating connection. Note the marked connection points. I found Rickson’s seminar videos confusing because it looked like connection was just hugging and talking about base. The concept is clearer now thanks to our new definition. Observe the image of Rickson demonstrating connection. Rickson applies firm, tight pressure with his hug. This removes slack and prevents his opponent from escaping. 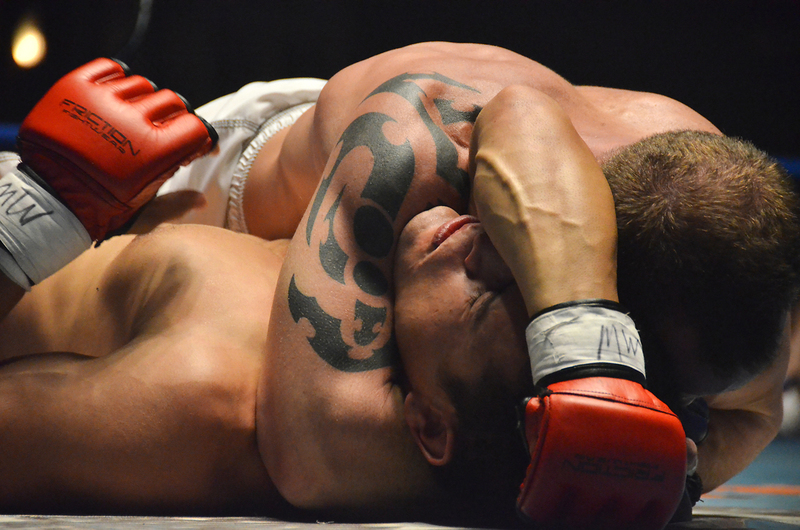 Rickson’s strong base allows him to move his opponent while remaining stable. 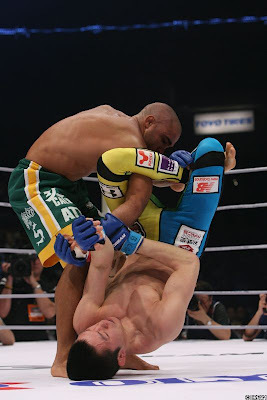 The firm, tight hug (connection) maintains a favourable angle, while base allows Rickson to control the movement. Cane’s description two people joining their bodies so that they make one unit and you are in control of how that unit moves , agrees nicely. Tony says about connection: with it my timing is perfect and I feel like I can read the mind of my opponent or anticipate his or her actions . We can improve our timing by slowing (restricting) our opponent’s movement. Again we have agreement with our definition. Henry says when you move, your opponent immediately feels the effects of it . This sounds like a description of removing slackness, combined with the tension there is a certain tension in the arms as well as the legs that Andreh describes. Andreh’s other descriptions both imply the ability to move more than the opponent. Namely When we are connected, we shift our weight in a way that doesn’t give our attacker anything to use against us . And being connected allows your base to remain independent of your opponent’s actions, while his lack of connection allows you to manipulate his weight and posture . Our definition of connection is consistent with Rickson’s demonstrations and the reports of his students/seminar attendees. We need to keep in the mind the function of what we are trying to achieve, not merely the mechanics of what we are doing. I believe part of the confusion surrounding connection is that people are focusing on the form (removing slackness, closeness of contact, the feeling of tension) and forgetting the function. Why do we need to mention movement in our definition? Can we define connection only as contacting our opponent with tension while removing slackness? Here’s a demonstration of connection from side-control bottom. We can see the points of contact and we can imagine the feeling of pressure. We can see how the bottom person has removed slack and is applying tension. Everything looks fine when we remove movement from our definition. Demonstration of connection. Note the points of contact. However, we see a problem when we look at the opponent’s freedom of movement. The opponent’s entire right side can move freely, despite the restriction of the left side. The restricted left side does not prevent the opponent from mounting, which is one of his primary goals from this position. Ignoring movement allows sub optimal jiu-jitsu to creep in. Our definition of connection, contact that restricts your opponent’s movement while improving your own ability to move, is important because it matters which parts of our opponent that we restrict from moving. Let’s look again at Rickson demonstrating connection. See how Rickson is contacting (connecting) all the parts of his opponent’s body that his opponent needs to move to escape. Rickson is combining the mechanics of connection (tight, firm contact with no slackness) with the objective of restricting his opponent’s ability to move. Note the connection points are precisely the points that Rickson’s opponent needs to move to escape. Connection may not be the silver bullet that distinguishes Rickson from everyone else, but it’s a necessary component of efficient jiu-jitsu. A clear definition helps to communicate the concept and avoid the confusion that currently exists.